Each poster presentation is allotted one poster board. Posters (sized ISO A0) will be exhibited throughout the conference. The author must be present at specified times during the designated poster viewing sessions. Presenters should use mounting tape to put up their posters. Mounting tape will be prepared by the Secretariat. The venue of poster presentation will be announced later. The poster size is ISO A0 with portrait orientation (W 841 mm x H 1189 mm). The title should be composed of CAPITAL letters at least one inch high. Use the minimum amount of text possible. Only use what is necessary to make your point. - Be concise, but answer the basic questions (What, When, Where, How, Why) using the standard format. - Introduction: background, statement of problem, purpose/objectives. - Methods: experimental design, techniques. - Results: data summary, findings. - Conclusions: interpretations, implications; organize the material to tell a logical, coherent story. Use large, BOLD lettering for readability. Use fonts that are easy to read (i.e., avoid fancy fonts). All text should be easily read from a 2-meter (+) distance. Use borders or white space to separate sections. Avoid large, continuous blocks of text. Use figures (graphs, charts and illustrations) (with captions) as much as possible, making sure that they are legible. The use of color will enhance poster readability (i.e., for contrast and to highlight important points) and attractiveness. Aesthetics are an important part of preparing a poster that will attract attention. Summarize results/findings. Bullets work well to summarize key points or contributions of the study. Keep your poster simple and provide a clear “take-home” message; you can provide details In discussions or during the conference proceedings. All presentations have to be in English. PowerPoint Presentation .ppt(x) facilities will be provided. All speakers have to transfer his/her presentation onto the conference laptop before the start of respective session. No personal laptop is allowed. Organizer laptop will only allow electronic slide presentations in Microsoft PowerPoint .ppt/,pptx or Portable Document File (PDF) formats. Please ensure that all graphics are embedded in the Microsoft PowerPoint Presentations file .ppt/.pptx. When creating your slides, check your settings to ensure that page is setup for On-Screen Show (4:3). Fonts should be standard (recommended to use san serif fonts) such as Arial or Courier. Introduce yourself to the session chairperson before your session. ​ARCSB 2017 welcomes the submission of abstracts for original contribution for oral and poster presentations. For detailed descriptions of each scientific track, please visit the SCOPE AND TOPICS page. Each participant is limited to ONE paper only but may co-author other papers. Abstracts can only be submitted online via the REGISTRATION page on our website; submissions by fax, post or email will not be considered. It is the author’s responsibility to submit a correct abstract. Any errors in spelling, grammar or scientific facts in the abstract text will be reproduced as typed by the author. You will receive confirmation that your abstract has been received, indicating the abstract title that you have submitted. Notifications regarding status will be sent once the review process is complete. The submission of the abstracts constitutes the authors’ consent to publication. Notifications regarding publication in AIP proceeding will be sent to authors via email. Authors of accepted abstracts will have the option to publish in scopus-indexed AIP proceeding with an articles processing charge (APC) of 70 USD. APC will be waived for the first 20 accepted abstracts for ARCSB 2017 conference. Authors of accepted abstracts who wish to publish in AIP proceeding are required to prepare an extended abstract according to the guideline of AIP proceeding. 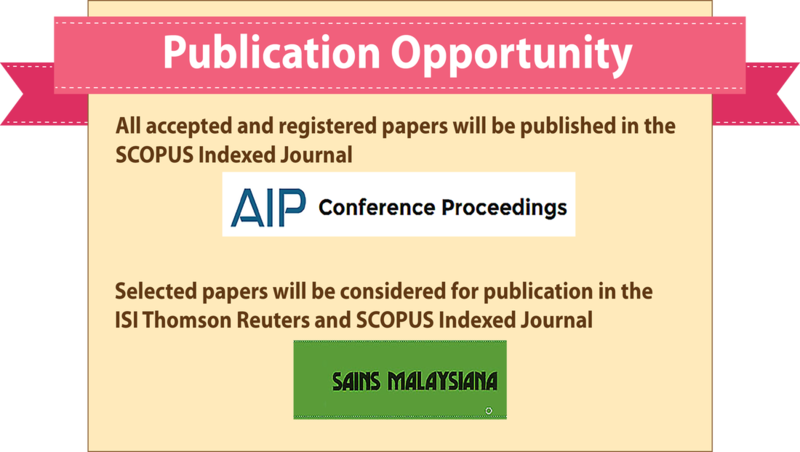 In addition, selected abstracts will also have the opportunity to publish their papers in ISI-Scopus-indexed Sains Malaysiana, ﻿﻿with an additional fee. Notification regarding publication in Sains Malaysiana will be sent to authors via email. Authors of selected abstracts are required to prepare a full manuscript according to the guideline of Sains Malaysiana. Please make sure that you keep to your allocated time. Strict time keeping will ensure the entire programme can run smoothly.